Journaling is something I recommend to all of my friends. It can be extremely beneficial to people with stress, it boosts creativity, and it's generally a calming experience. I've learned that coloring has a lot of those same benefits. Adult coloring is a really popular trend right now. There's groups on facebook about it, books designed specifically for it, and magazines dedicated to it. Pairing it with journaling is pure genius because I feel like its furthering the benefits of both journaling and coloring. 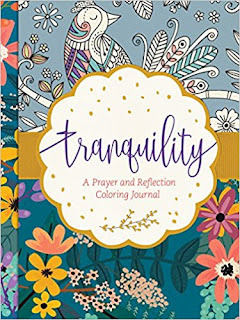 This book features a coloring page of some sort (difficulty varies) and then the accompanying page gives you a place to journal. Most pages include a Bible verse or a writing prompt of some sort. There are few things that didn't fit my style in this book. For one, I don't always have time to sit down and color an intricate coloring page. I usually ended up skipping the coloring part. I also found that a lot of the journaling pages didn't give me the room to get out all my thoughts. This was upsetting as a new page gave me new inspiration and I didn't want to take up that space. It also asks you to draw occasionally, but I just used that space to write. All in all this is a really great book. I would recommend it to anyone who loves writing or coloring. Each journal page gave me really inspirational content that helped my writing flow. I really enjoyed this book even if I've come to realized I don't enjoy the coloring part.This would make a great and beautiful gift. I give it 4 out of 5 stars due to the occasional lack of writing space. I received this book free from Tyndale publishers in exchange for an honest review.